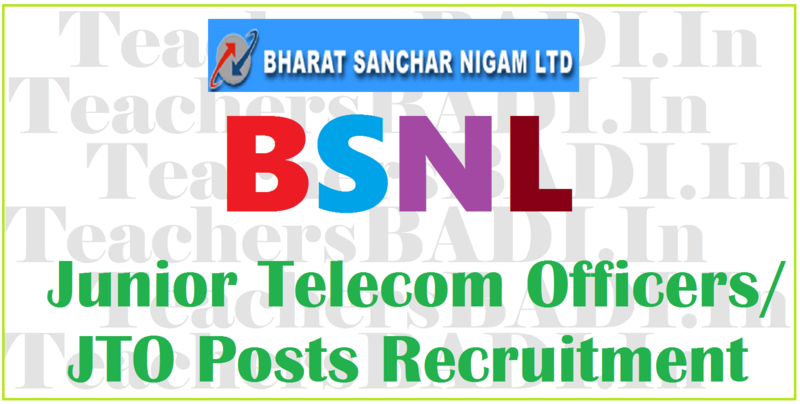 BSNL 198 JTO Posts 2019 Recruitment Notification, BSNL to recruit engineers, online application opens March 6: Bharat Sanchar Nigam Ltd. (BSNL) is going to filling up 198 posts of .Junior Telecom Officer /JTO. All candidates fulfilling the prescribed eligibility conditions and possessing qualifications are eligible to apply for the above said post. So, Bharat Sanchar Nigam Limited, New Delhi has invited applications for the recruitment of Junior Telecom Officer (Telecom) posts for GATE Score candidates. Recruitment for Graduate Engineer to the post of JTO Junior Telecom Officer in BSNL from Open Market through valid GATE Score 2019. BSNL Proposes to recruit 198 posts of Junior Telecom Officer(JTO) in the IDA pay scale Rs.16400-40500/- through valid GATE SCORE 2019. The Candidates having qualification BE/BTech or equivalent in Telecom/ Electronics/ Radio/ Computer/ Electrical/ Information Technology/ Instrumentation Engg. or MSc Electronics/ MSc Computer Science are required to appear GATE Exam 2019, opting one paper from selected four disciplines of GATE paper codes i.e CS and IT/EC/EE/and IN. Details are available at www.gate.iitr.ernet.in. Bharat Sanchar Nigam Limited (BSNL) has invited applications for recruitment of junior telecom officer (JTO) civil and electrical posts. Candidates can apply online through the official website bsnl.co.in.There are a total of 198 posts. The registration process for BSNL JTO recruitment 2019 will commence from February 11 and close on March 12, 2019. The mode of selection will be through GATE score of 2019 which is conducted by IIT Madras, Chennai in the month of February 2019. Candidates will be selected on the basis of valid GATE score 2019. The BSNL will not conduct any further examination or interview for this purpose. JTO (T) is a circle-based cadre and the candidates will be selected against the vacancies of a particular circle. The selected candidates will have to serve in a particular circle until they are promoted to the all India cadre. Candidates will be allowed to apply only for one circle in which he/she desires to serve, consequent upon his/her selection. Once a circle is selected by a candidate, no request for change will be accepted. The circle wise merit list will be prepared from GATE Score-2019 and accordingly circle wise cut off will be decided based on the vacancy in the circle. The list of the BSNL circles and vacancy details are given below link. c. Nationality: Only Indian Nationals would be eligible to apply. Applicant must possess the educational qualifications as Bachelor of Engineering Degree in Telecommunications/ Electronics/ Radio/ Computer/ Electrical/ Information Technology/ Instrumentation. Selection Procedure: The mode of selection is through GATE SCORE-2019 which has to be conducted by IIT Madras, Chennai in the month of February 2019. Recruitment for Graduate Engineer to the post of JTO Junior Telecom Officer in BSNL from Open Market through valid GATE Score 2019.